Designed to look like an axe (that functions!) the tool also includes: a wire cutter, hammer, flat head and Philips head screwdrivers, saw blade, file, knife blade, bottle opener and more. A perfect Father's Day gift for the DIY Dad. Free Engraving! One line with up to three (3) initials can be engraved on beech wood handle. Enter information to be engraved using the personalization option during checkout. 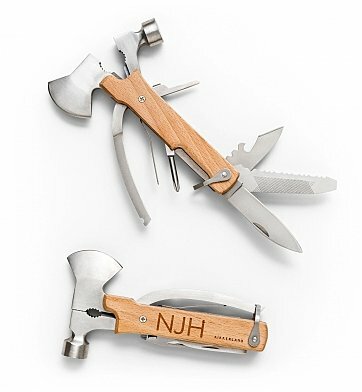 Engraved Axe Multi Tool is a hand delivered gift. These gifts are delivered by one of our local design centers located throughout the United States and Canada. Same day delivery is available for most gifts when ordered before the cutoff time. The cutoff time for Engraved Axe Multi Tool is in the recipient's time zone. Complimentary engraving on the axe's beech wood handle. Include free card with your personal message or greeting.